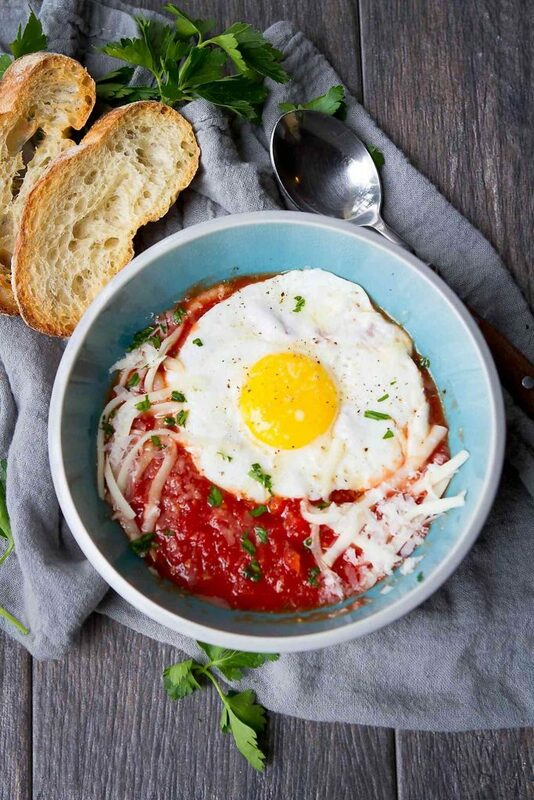 Have you ever tried Eggs in Purgatory? If not, stop what your doing and make this immediately for breakfast, lunch or dinner! Easy, healthy and delicious – plus it comes together in less than 15 minutes. 240 calories and 3 Weight Watchers Freestyle SP. I’m wondering why it has taken me so long to make eggs in purgatory, or uova in purgatorio as it is called in Italian. The tongue in cheek name refers to the spicy tomato sauce and the eggs (representing those poor souls who inhabit Purgatory!) cooking in its fiery heat. And the flavors just can’t be beat! 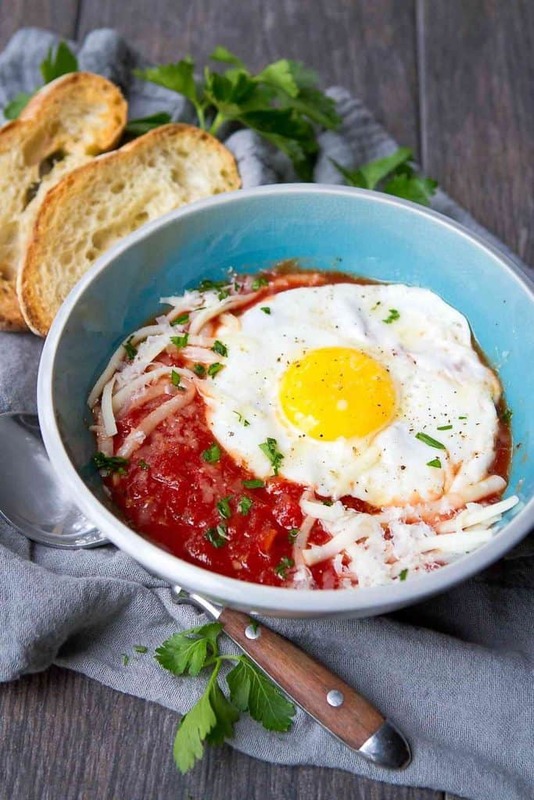 Traditionally, eggs in purgatory recipes involve poaching the eggs directly in the sauce, but this version is a slight variation on that theme, using fried eggs rather than poached. Either method works and both produce a dish that’s full of flavor, nutrients and protein that works for breakfast, lunch or dinner. If you follow me on Instagram stories, you likely saw that I was cooking from a new cookbook earlier this week. 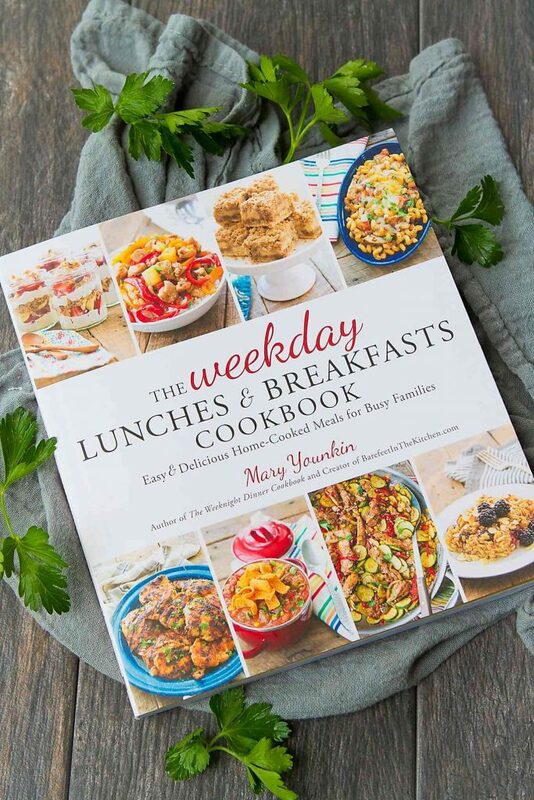 Mary Younkin of Barefeet in the Kitchen has put out a cookbook, The Weekday Lunches & Breakfast Cookbook (affiliate link), that is packed full of fantastic recipe ideas, including this easy egg recipe. 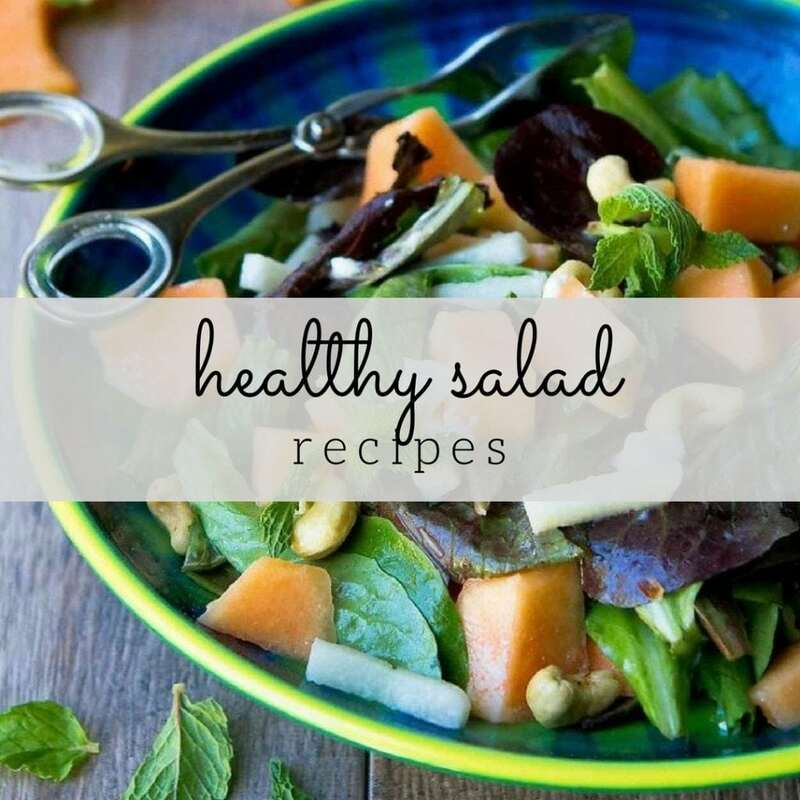 The book contains recipes that are easy to put together, including an entire section on make-ahead recipes that have been tested for refrigerator and freezer storage. Perfect for meals throughout the week. 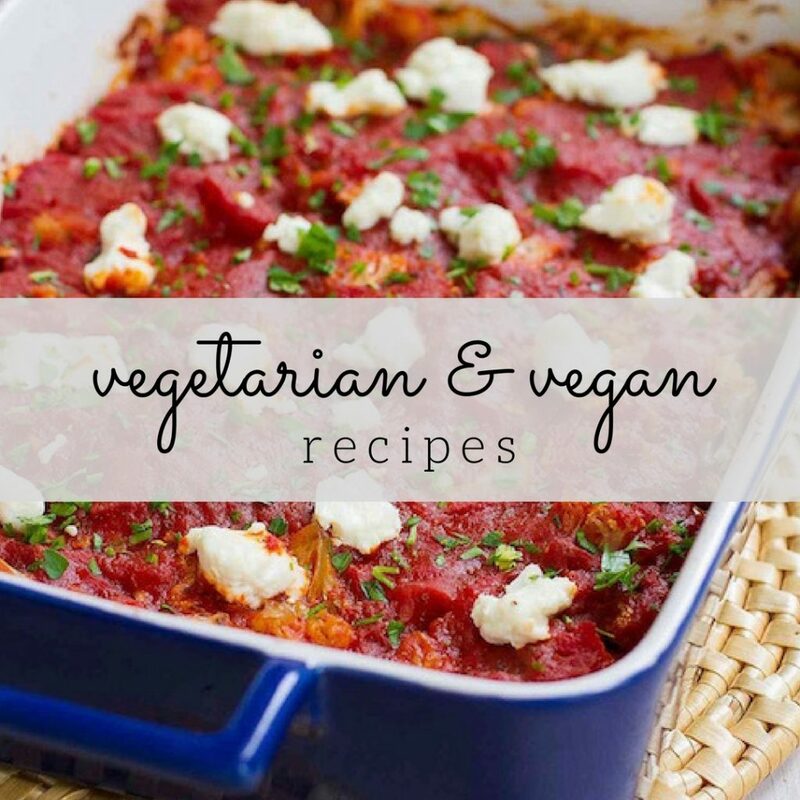 Some of the recipes that caught my eye? Crispy Green Chile Pork Skillet, Savory Oatmeal with Mushrooms and Egg and In-A-Hurry White Chicken Chili, to name a few. Start by making the easy marinara sauce. 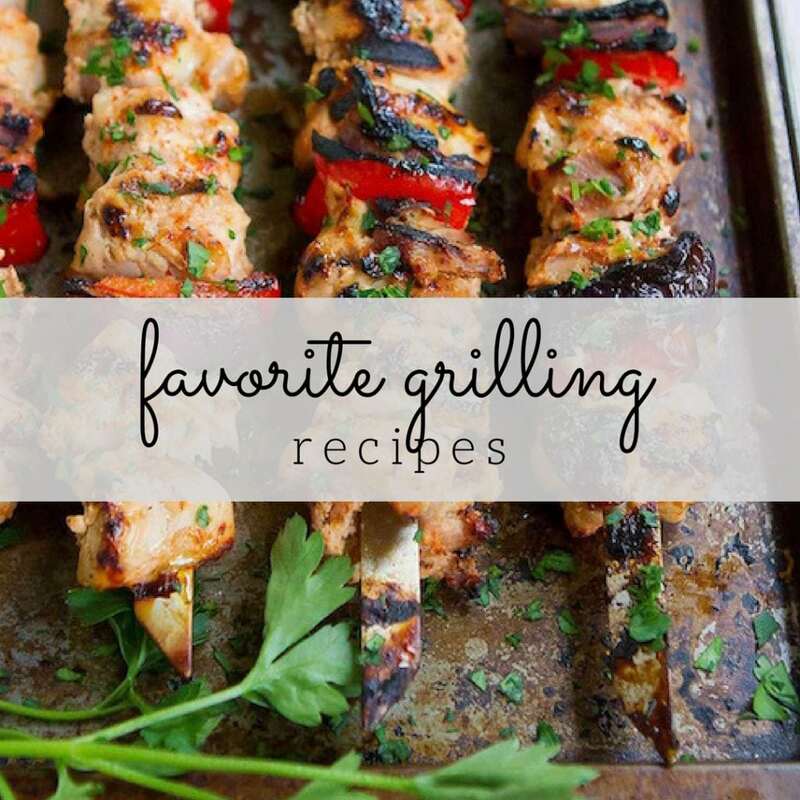 The ingredients list may be simple, but with a ton of garlic and a pinch of red pepper flakes, the flavor is out of this world! I decreased the olive oil slightly from the original recipe. While the sauce is simmering, cook the eggs. As mentioned above, the eggs in this recipe are fried, but you could also poach the eggs directly in the sauce. If you use the poaching method, cover the pan with a lid to help steam the eggs. The original recipe called for cooking the eggs in butter, but I opted for lightly coating the skillet with cooking spray. Butter, ghee, olive oil spray…any of the those would work. If preferred, make the tomato sauce ahead of time and refrigerate. Reheat while cooking the eggs, then serve. Warm the oil in a medium-sized skillet over medium heat. Add the garlic, salt, red pepper flakes, oregano and basil. Saute, stirring occasionally, until fragrant, about 2 minutes. Add the tomatoes and simmer for 2 minutes. While the sauce is simmering, heat a medium nonstick skillet over medium-low heat. Lightly coat with cooking spray. Add 2 eggs to the skillet. When the edges of the eggs turn white, season lightly with salt and pepper. Add water to the pan and cover with a lid. Cook for 2 minutes, until the eggs are done to your liking. Slide the cooked eggs onto a plate and tent with foil. Repeat the steps with 1 to 2 more eggs. Scoop the sauce into bowl and top with mozzarella and Parmesan cheese. Sprinkle egg bowl with parsley, if desired, and slide an egg over the top. Serve with the crusty bread for dipping. I’m thrilled that you liked the recipe, Dara! I’m all about the easy recipes too. This one is a kid favorite in my house! That looks tasty! And I am really excited to get to meet Mary at Everything Food next weekend! Thanks for the shout-out for my recipe too! 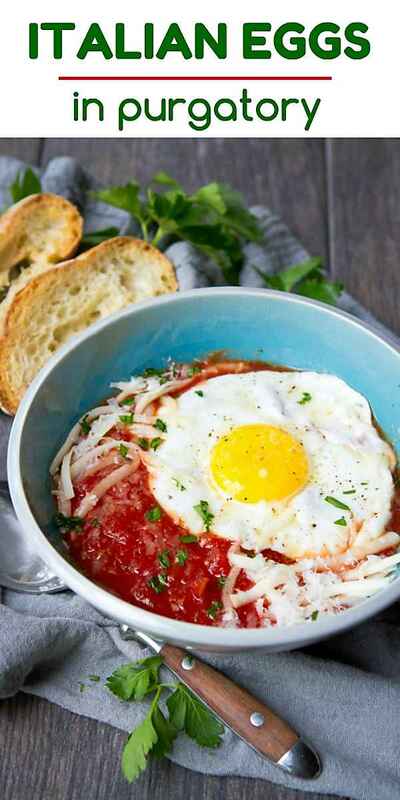 I always wanted to try Eggs in Purgatory. Will surely try it on this weekend. Thanks for the recipe. Great recipe. I usually cook the eggs in the sauce. But either way, this is great for breakfast, lunch, and dinner!